Megableu make great family games that everyone can enjoy and they have given me a bundle of 3 of their newest games to give away to one of my readers - Beat the Flush, Tumball and NAME THAT! NAME THAT! 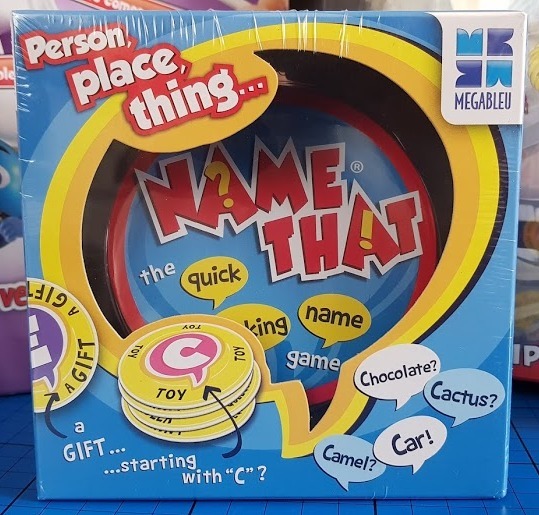 is a really fast-paced word game where players must think on their toes and answer as quickly as possible. Person? Place? Food – name it fast! 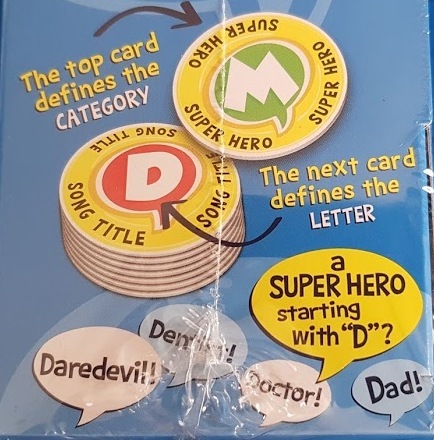 The top card on the pile decides the category and the next decides the letter. It's incredibly easy to pick up the gameplay, you can work it out before you even open the box - but it's much harder to think of answers when you are under pressure! 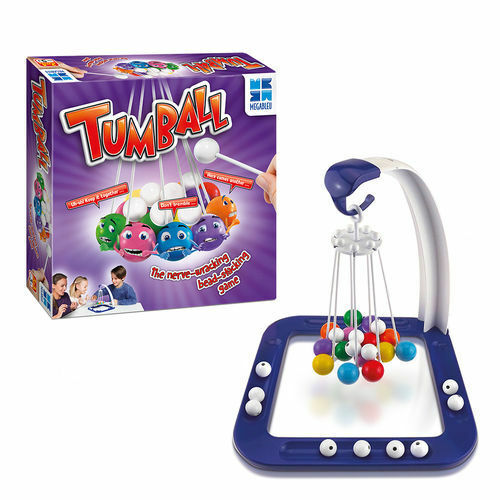 Tumball is new for 2017. This is a tense bead-stacking game where you need a steady hand and a calm demeanour. 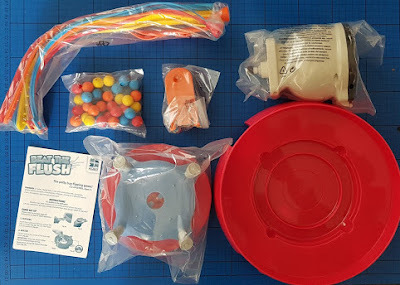 Set up is around 15 minutes the first time you play and everything does go back in the box! A great one to help concentration and manual dexterity skills. 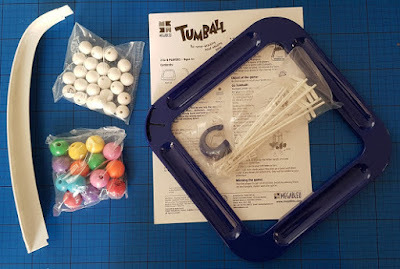 With every bead you add, the space between the coloured balls will open wider and eventually... TUMBALL! This game really reminds me of several we played as children, you never forget the sound of lots of marbles falling onto the table. 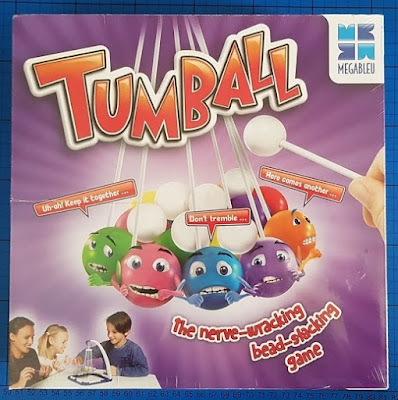 If you want to be reminded of that momentarily disappointing sound - which always seems to be a surprise even though you expect it, there's a Tumball video here. Any beads you knock down are added to your collection and the first to get rid of all their beads wins. The blue stand is genius because not only does it store your beads, it also prevents most of the fallen ones from rolling away. For 2 -4 players aged 5 years+. £17.99rrp. Beat the Flush is also new for 2017. Frankly this game is quite potty and it's the only one I got photos of while there was still some light. This is the only one that needs batteries (2 x AA not included), but otherwise all 3 of these games are ideal gifts, open in moments and Christmas morning-friendly. 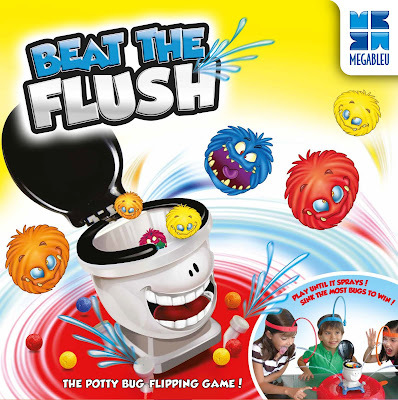 Each player has a magnetic headband and has to catch their own coloured bugs and then flip them into the toilet. Sounds easy? No! 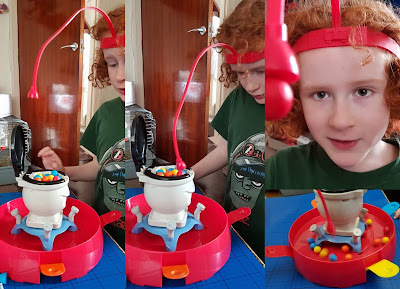 It's much harder than you'd think, and the toilet spins around as you play, plus the base vibrates the bugs everywhere, so aim is even harder. 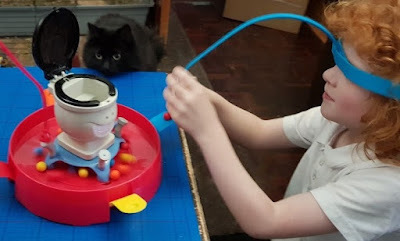 My 9 year old cheated with it switched off to get the hang of it. 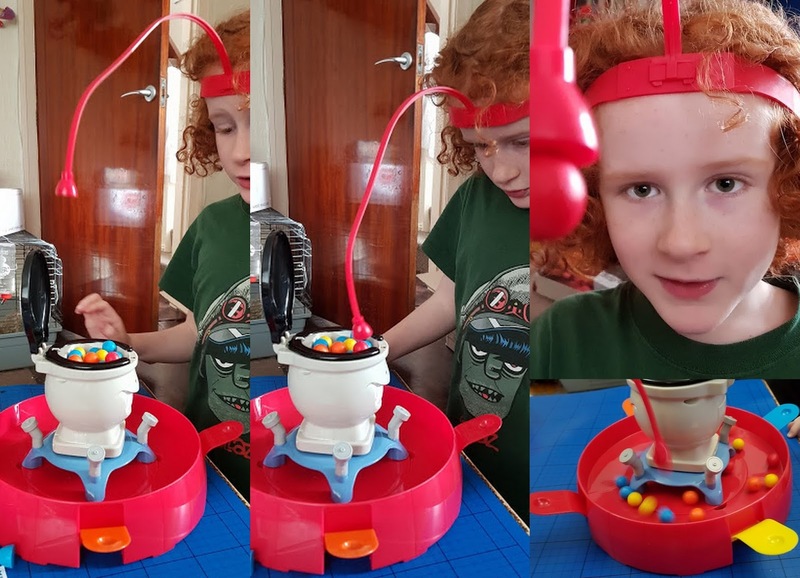 Bugs start in the base, catch one on the headband and flip it - but a word of warning that the flippers can send these bugs almost to the moon! You need a very gentle hand, which is hard when you are trying to be quick. Calm and collected wins the day. Megableu games are available to buy now from selected toy retailers including Smyths, Debenhams and Amazon. You can find out about stockists and check out the whole range on the Megableu Website. For your chance to win this entire games bundle of 3 games worth over £55, enter using the Gleam form below. Neither Gleam or I will store your details or use them for anything other than this giveaway. 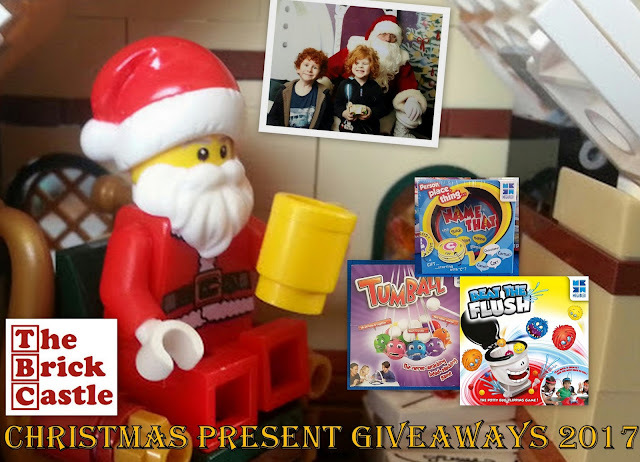 The random winner will be drawn after the giveaway ends at midnight Sunday 3rd December. Open to UK entrants only, full terms and conditions are at the bottom of the Gleam form. 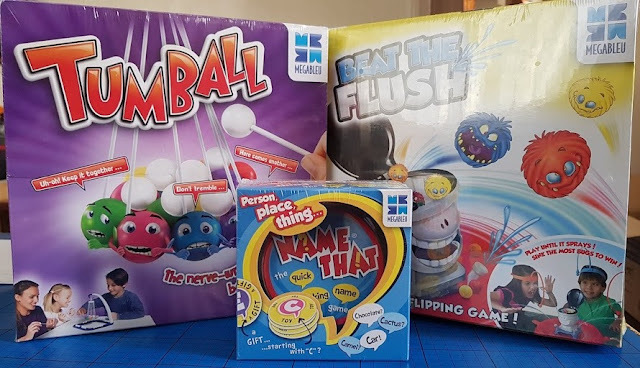 We were sent our games for review and photos. The Amazon link is an affiliate link, so I get a few pence each time someone orders through me, but they don't pay any more! Corny jokes in Christmas Crackers. Christmas, carols and candy canes. Cranberry sauce, Christmas cards and crackers!!!! Crackers, Christmas and Chapped Cheeks. Christmas, Christmas Carols, Christmas Cards. Cranberry sauce, copious amounts of chocolate for breakfast, crazy kids on Christmas morning! Left over Cranberry sauce with my Cheese and Crackers ....lovely!!! Carols, crackers and Christmas cake! Candy Canes, Cranberry Sauce and Christingles !! Tell me 3 festive or Winter things all beginning with C .
Candy canes, candle light & carols! Carols, Choirs & cards. This is my favourite time of year! I love family games. Crackers, Christmas cards, candy canes! Cinnamon, Candy Canes & Crackers!